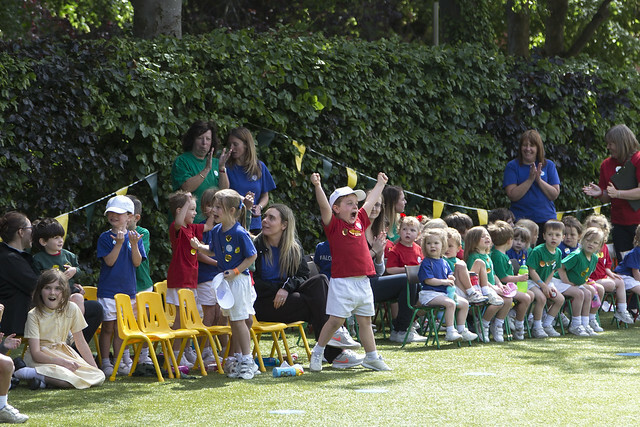 The Infants and Fir Cones kicked off their sports day with a march past of house colours, banners and smiles. There was an air of nervous excitement and a parade of happy faces. All pupils were placed into matched-ability groups within their year group. They raced with the same group for all their 4 events, enabling them to show-off their abilities and enjoy their races. There was a positive vibe at the starting line and although some of our youngest competitors were a little overwhelmed, everyone had a go. Year 6 prefects were on hand to support and encourage the Fir Cones and everyone made it down to the finish line. 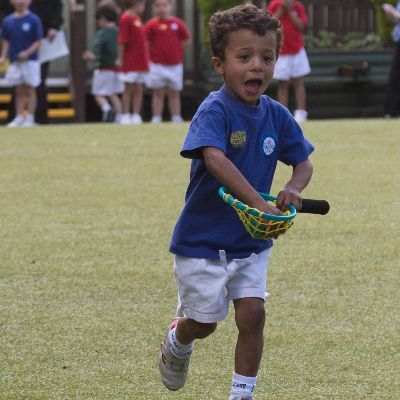 Races included a sprint run, the sack race, obstacle course races, bean-bag races and skipping with hoops. Everyone who took part was rewarded with a sticker badge to acknowledge their efforts and give them a sense of achievement. The audience of families and the spectating pupils, sat on the side-lines in their houses, cheered on the competitors and displayed a wonderful sense of teamwork. 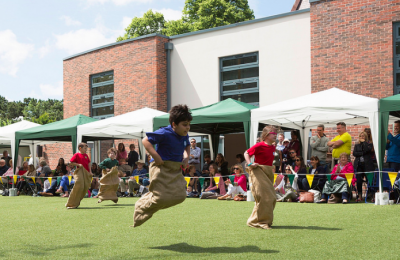 Parents were called upon to enter their own ‘bean-bag on the head’ race, much to the amusement and pride of the pupils. They were able to sit back, take a rest and watch the balancing skills of their parents in three heats of mums and dads. Some impressive skills were on display although others need more practice before next year’s sports day! After the final race of the day, the points were totted up and the winning house, the Hawks, were declared the victors with 111 points. Eagles and Falcons both tied for the runner up position with 98 points each. It was a hot and fun day and one that all the children can be proud of. Many thanks to Mr Girvan and Miss Roberts for organising this event and to all those who helped to make it a success.